Just because there’s a pool does not mean that everyone can or enjoys swimming in it. Not everyone swims, but everyone does love to cool off and play. Fortunately, not every fun pool activity has to involve swimming! We have some great ideas on how to include kids (and even adults) who can’t swim in the pool fun. This activity is more for the young ones and all you need is a paint brush. Encourage kids to sit by the shallow end of the pool, dip their clean paint brushes into the pool and use the water to ‘paint’ the pool deck! The water will temporarily darken the deck allowing kids to create all kinds of images and even work on their lettering and numbers! There’s no clean up and kids will be right in the middle of the pool action without having to swim. Have anyone who does not wish to swim sit on the side of the pool (preferably in the shallow end) with their feet hanging in the water. Then when you say ‘go’ everyone starts kicking! The kicking will start to churn up the water and before you know it your gentle pool will feel more like the rocky sea! Lots of fun for the swimmers in the pool (especially if you have an inflatable raft or floaty) and a great way to include those who don’t want to get fully in the water. There are few more perfect places for water guns than around and in the pool. They’re waterproof, easy to fill in the pool and everyone’s already getting’ wet anyways. Water pistol fights can be a great way for non-swimmers to have some watery fun without ever having to get in the pool. You can even set up a target in the pool and have shooting contest! 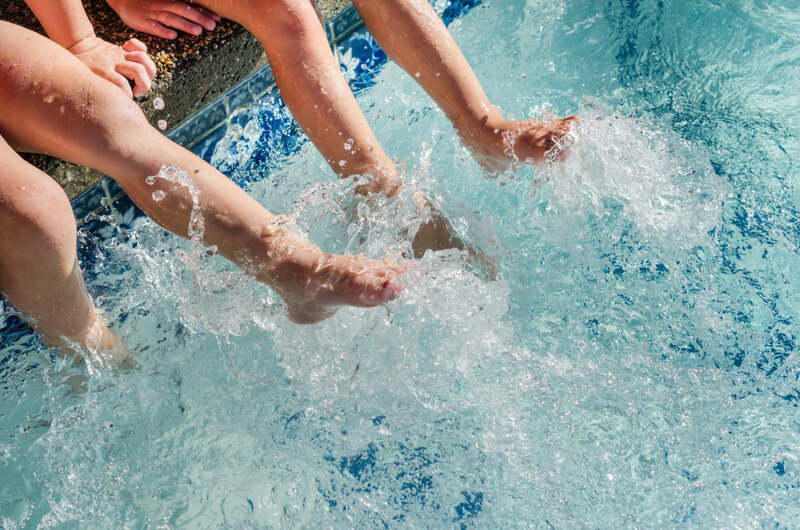 Just make sure there is NO running around the pool – especially for people who don’t swim, since a fall in the pool could potentially be serious. Up the action by adding water balloons. With just a little creativity there are countless ways to have fun with friends and family around the pool, both in and out of the water.